At twelve, Martin contracted an illness that left him debilitated–unable to speak, move, or thrive on his own. His family continued to care for him, but did not realize he was aware of his surroundings. Then a care-giver changed his life by treating him like a person, believing in him, and helping him connect with an opportunity to learn to speak using technology. 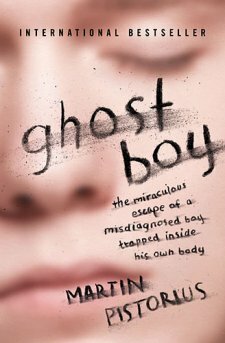 Now he shares his touching journey of having been very much awake and alert as a “ghost boy” within his unresponsive body. He pieces together his memories, sharing his strength in overcoming obstacles to re-enter the world by learning to communicate, gaining independence, and finding love. This is a touching memoir, and insightful coming-to-age story, from one who has overcome so much adversity. Martin openly shares of being abused (verbally, physically, and sexually) in some of the special needs institutions that he spent time in over the years. He also shares of overhearing family members complain about the burden of caring for him, and of the many difficulties of being respected and noticed within the “real world” as a special needs adult. His positive attitude throughout it all is inspiring, as is the way he speaks of God as an ever-present companion in the years when the outside world could not recognize the life and intelligence of his active spirit. I found parts of the narrative hard to follow as it is not always chronological and felt jumbled at times. The writing itself also varies between very engaging, and not-so-much. Overall though, it is a blessing that Martin can now share his story. He and his wife Joanna are both strong and inspiring individuals, and Martin’s perspective gives new meaning to what it means to be alive.